I was born in 1969, I am married, and my job is to teach English to adults. 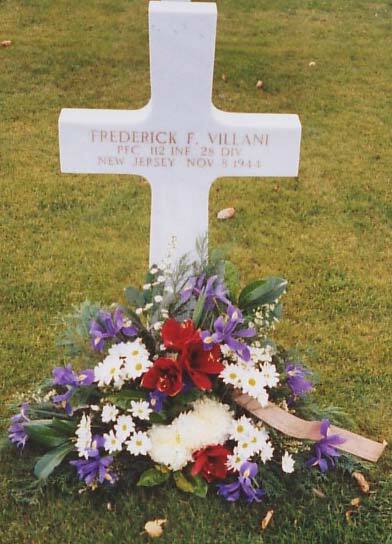 I live near Liège, a city in Eastern Belgium and in 2001 I adopted the grave of PFC Frederick (Fred) F. Villani, from New Jersey, 112th Infantry, 28th Division, KIA in the Hurtgen Forest on November 8, 1944, buried in the American Cemetery of Henri-Chapelle. I consider myself his “war godmother”. What is a “war godmother” ? 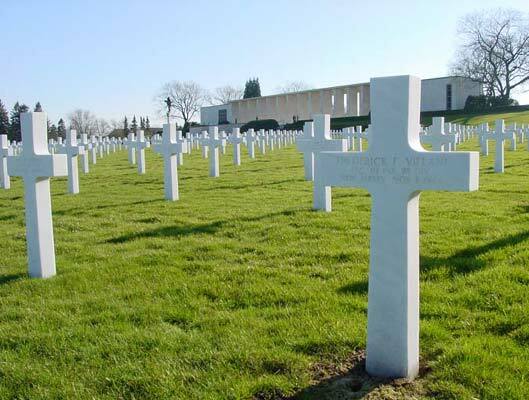 It is a person who decides to adopt the grave of an American soldier. It is very simple and you don’t have to do much. You don't have to pay for anything. All you are expected to do is to put fresh flowers on the grave once in a while, to come and visit your “godson” any time you want and to meditate at his grave. This is not limited to women, as there are many godfathers as well. My husband, for example, is also a “war godfather”, as I will explain later. There are different reasons that can make you become a war godparent. Let me explain mine. First, you should know that pro-American parents raised me. 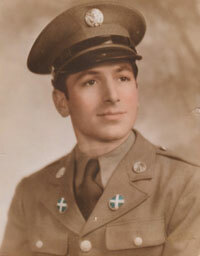 My father was 10 years old in 1944 when American soldiers liberated his village of the Geer valley. He used to follow them everywhere and they always treated him with kindness, giving him chocolate and chewing gum, etc. So my father grew up full of admiration for these boys, and he gave to his daughters, my sister and I, an education full of love and respect for America and its people. I could sing phonetically in English (thank you Frank, Elvis, Dean, Nat ...!) before I could speak French properly. When I was 19, I got the opportunity to visit New York (3 days) and Denver, Colorado (3 weeks in a host family) and I liked very much what I saw there and the people I met. 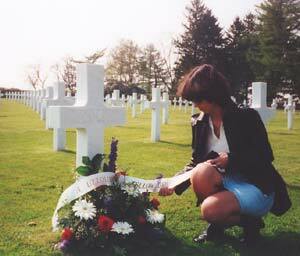 I had already visited the American cemeteries of the Ardennes (in Neuville) and of Henri-Chapelle a number of times before I learned through my sister (also a war godmother, but in Neuville) about the possibility to adopt a soldier. When I heard about it, I called the cemetery of Henri-Chapelle, which is, to me, the most beautiful in the area, with its superb archangel watching over the graves, and I asked to adopt a soldier. What they do there, is that they try to find a soldier whose name resembles yours : my husband's name sounding more Dutch than anything (Achten), we started from my maiden name "Villers" and we ended up with "Villani". I was given the location of the grave and, later on, I received a beautiful certificate of adoption with all the information in their possession on “my soldier” (rank, serial number, organization, decoration, date of death and state). Every year, I receive an invitation to the Memorial Day ceremony, which I never miss. I feel so proud of my godson (as if he were my family) when I go to his grave, along with the parents and relatives of the other soldiers, to put some flowers and pray. But I didn’t stop there. I wanted to know more about Fred and I especially wanted to find whether he had any relatives who were still alive. I wanted them to know that there is someone here to take care of Fred's grave and memory. I also wanted them to know that I would be happy and honoured to guide them here in Belgium, if they ever wanted to come and visit Fred. For all these reasons, when I got the Internet in December 2001, I started a search on line. I visited hundreds of sites on WW2, sent hundreds of emails and met many wonderful people. By early February 2002, I contacted a newspaper in Newark, NJ, where Fred lived before the war, to ask them to search their archives for Fred’s obituary. One of the journalists, William Gordon, read my e-mail and decided that there was great material for a story. He offered his help and said that if we found some relatives, there would be a story in the newspaper. And William did a wonderful job : by March 5, he discovered Fred belonged to the USCC Corps in 1935 and that he was a metalworker in 1940. He was listed “in the US Army” in 1943. By then, the Newark Public Library had found Fred’s obituary for me in the Newark Evening News of April 6, 1945 (5 months after his death !). Thanks to this small article, I learned that Fred had been inducted in November 1940, and that he had three brothers and five sisters. The article listed all the names and William Gordon successfully used this information, as you will read. The article also mentioned the school from which Fred graduated and a History teacher of that school searched the yearbooks to find Fred’s picture. At last, I could see what he looked like : a handsome young man, with frank eyes, almost ready to smile as the picture was taken. That was on March 12. Then, on March 14, William Gordon made a blind call to an Eva Speziale who appeared to be Fred’s grandniece ! She led William to her father Gregory Speziale (60), son of one of Fred’s sisters who had recently died, and to her grandaunt, Carmella Catone (82) from California, Fred’s only surviving sibling. They were all very excited about the news. William gave me the addresses and the phone numbers (neither Carmella or Gregory have a computer) and we have been in contact several times since then. I especially correspond with Carmella because she kept all her brother’s letters and pictures, and she has got so many things to say about him. When Fred’s father learned that his son had been killed, his hair turned white overnight. Carmella is the only one who came to Henri-Chapelle to visit her brother. She came with a cousin in 1956 or 1957. Her father asked her to bring back some soil from the grave, which she did. The soil is buried with him, as he requested. On March 23, I received a phone call from Virginia Mayo, photographer at the Associated Press in Brussels. She had been hired by the Star Ledger to take some pictures of me next to Fred’s grave, in order to illustrate William Gordon’s article. We met the following day. On April 8, I was making the news under the headline : “Perpetual Care : A Belgian woman lovingly tends the grave of a soldier from Newark”. It is a long and beautiful article and William Gordon respected everything I had told him. He didn’t change a word. There have been many reactions to the story. William Gordon received some phone calls and letters from readers, as well as positive responses from colleagues and superiors. I received some beautiful letters and among them, one which particularly touched me. It came from a retired Newark police officer who went to the same school as Fred, lived in the same neighbourhood and had some friends by the name of Speziale. Along with the letter, he joined a 25$ check to buy some flowers for Fred from “a fellow Down-Necker” (“Down-Neck” is the name given to Fred’s neighbourhood by the people who were born there). Needless to say Fred received a wonderful bunch of flowers and we took some pictures when we brought it to Henri-Chapelle, in order to send them to this gentleman. During my search, I came in contact with many people of the AWON (American World War 2 Orphans Network , see their website : www.awon.org). One of them, Gloria from Montana, lost her father when she was 4 years old. Pvt William George Gray was KIA near Harspelt, Germany in September 1944 and is buried in Henri-Chapelle. She says : “I don’t remember him at all”. Yet, she practically begged me to adopt his grave. As she says, she may never have the opportunity to come to Belgium and she was anxious to find someone to take care of her dad. Since I’m already a godmother to Fred, my husband proposed to adopt William and so, here we are, proud godparents! I will never forget all the wonderful and brave young men who decided one day to fight for freedom and who paid the ultimate price. I also wish to thank all the veterans and all the soldiers on duty who are still fighting for world freedom as I am writing this. All material on this page is the copyright of Régine Villers, all rights are reserved. Thanks Régine for your beautiful story and your wonderful work.